The soundtrack of the Midwest last summer was 1970s Album Oriented Rock, and not just some places, but everywhere we went: Fong's Pizza and Tiki Bar in Des Moines, Iowa, Zup's Market in Ely, Minnesota, the YMCA in Omaha, Nebraska, a hotel lobby in Minot, North Dakota. In coffee shops, bars, bookstores and bakeries, if it wasn't Billy Joel's good dying young, it was Grand Funk's American band; if it wasn't Bob Seger's black-haired beauty, it was Led Zeppelin's woman who would not be true; if it wasn't Elton John's tiny dancer, it was Neil Young's cowgirl in the sand. It was all dudes all the time, Seals and Crofts and Hall and Oates and Steely Dan warning Rikki not to lose that number, drinking scotch whiskey all night long and dying behind the wheel. The beer was Grain Belt, "The Friendly Beer," or Grain Belt tallboys, "The Big Friendly." We drove 120 miles an hour on Route 2 for a few minutes, way up at the top of North Dakota, the road wide and empty and flat and Fleetwood Mac begging us not to stop thinking about tomorrow. Kate opened a Big Friendly before we stopped for the day and we passed it back and forth as we drove past prairie potholes full of ducks, so many cabbage moths fwapping against the windshield we thought it was hailing. The beer was icy from the cooler, perfect after a long drive. In the 1930s, Grain Belt was promoted as "The Friendly Beer With the Friendly Flavor," and the flavor was friendly, which is to say it was more water than boiled hop stew. 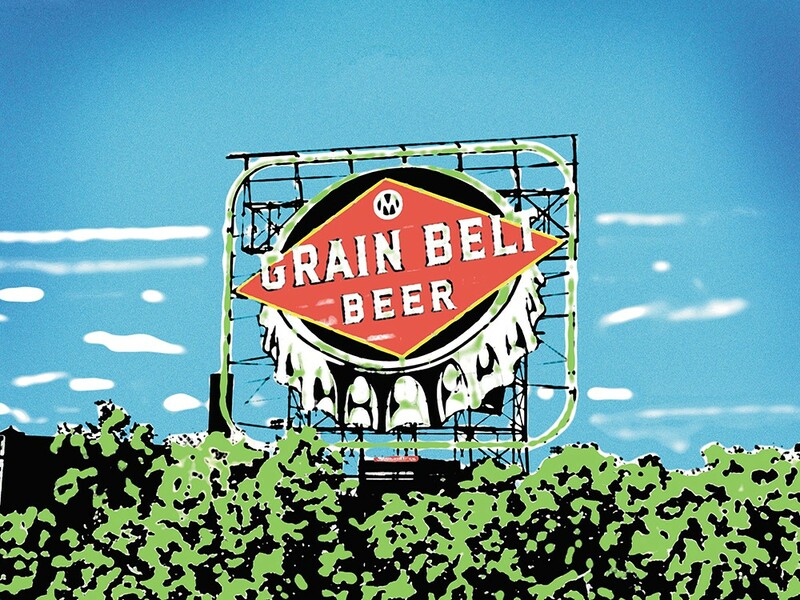 Grain Belt's an old-fashioned brand, or pretends to be — part of our current nostalgia, our longing for something authentic from the past, something friendly. And while there's something inauthentic about friendliness today, something fraudulent about the word "friend" as a verb (friend me! ), something false about so many of our interactions with our friends on Facebook, some of whom we hardly know or have never met, the people in the Midwest, where Grain Belt's brewed, were friendly, especially Iowans, and not in an irritating, stupid-seeming way, or a pretending-to-like-you-but-really-hating-you way. People I met there wanted to talk and listen, and they were good at it. They possessed a disarming, self-deprecating sense of humor, too, illustrated perfectly by a story in the Des Moines Register about the word "Moines," which Iowans have long believed is "a French derivation of Moingona, an Indian tribe that once lived along the banks of the Des Moines River," but that's really a joke that French explorers didn't understand, one tribe mocking another tribe and the explorers themselves. The "Moines" in Des Moines doesn't originate from "Moingona," but from "mooyiinkweena" — which translates, politely, to excrement-faces." Most of the people I met in Des Moines, however, were not excrement-faces. They knew they weren't part of the Brooklyn/Austin/Portland cabal of cool, but they also knew they had good food, good coffee, good bookstores, and good bars filled with people who could laugh at themselves. Maybe that laughing and friendliness, which felt like the opposite of poser cool, was what felt authentic or genuine about the place, even if Grain Belt's "Friendly Beer" tag is nothing more than empty marketing. I did meet one excrement-face in Des Moines — in the Western tent at the Iowa State Fair. I was in line to buy a bullwhip, not to satisfy a fetish or a ranching need, but because when I was 10 years old and driving from Michigan to Oregon with my family, we stopped at a store in Cheyenne where I bought a black cowboy hat and a braided, wood-handled whip. I whipped everything that summer, trees and sidewalks, my bike and the grass and a railroad-tie retaining wall. My mother confiscated the whip several times for whipping too close to my siblings, but I never actually struck anyone and finally whipped the thing into shreds. Now, in 2015, I wanted another whip like that one. But bigger. A bullwhip that rotated on a wooden handle when you whipped it around your head, almost whipping yourself in the face every time you cracked it. I didn't go into the Western tent looking for a whip, but once I saw one I wanted it. Unfortunately, buying a whip brought out the excrement-face in me, too — and just when it seemed I was learning friendliness. The dude in front of me was wearing cowboy boots and a cowboy hat — this was a Western tent after all, even if it wasn't 1886. I don't know why it was taking him so long to buy his wife a pair of boots. Maybe the friendly person working the register was kind of stupid. I needed to complete the whip purchase because Kate had business elsewhere at the fair. It was hot in that Western tent. Time was running out. The cowboy in front of me finally finished his transaction and I advanced to the register with my whip. That's when the excrement-face behind me spoke up. "Excuse me," she said to the cashier. "Can I just ask you something real quick?" I tightened my grip on the whip handle, feeling every second I'd lived on the East Coast boiling inside me. The excrement-face said, "Can you just tell me where the saddle something/halter something/bridle something-something is?" The clerk walked out from behind the counter. "Let me go find it," she said. Something particularly unfriendly rose in me then. I said to the cashier, "Can I just ask you something real quick? Since I was next in line, can you just help me before you help the person who was behind me?" The cashier looked between me and the excrement-face, but returned to her register. The excrement-face grunted. Everyone in line was mortified. I know that because I could feel their mortification burning holes in the back of my neck. I know that because Kate, whose parents were raised in Iowa, sighed almost silently beside me. I laid the whip on the counter. I'd handled the whole situation wrong, betraying something of this place I was growing to like. I had the feeling that nobody approved of the excrement-face or her bad behavior any more than I did, but nobody would have stopped her either, something about two wrongs not making a right, about not being willing to meet aggressive rudeness with aggressive rudeness. This was before I'd discovered Grain Belt, the friendly beer. I was failing as an Iowan, disappointing and embarrassing everyone. Maybe the bullwhip was another indication of my failure. I bought it anyway and got out of there fast, sort of ashamed. I walked past the tractors and trailers and balers and cultivators and backhoes and hot tubs to the food building. That's where I met the racist cop, maybe an hour later. Nice guy. Which was what made his racism so confusing. I don't think he knew he was racist. Maybe most people don't know when they're being racist, though less than a week later I'd meet a self-described racist in Omaha, who would tell me stories about the town he grew up in, and about Templeton Rye, which markets itself as The Good Stuff and which is good stuff, though also bad stuff, a craft whiskey with naughty origins. According to Templeton's propaganda, "It was in the early 1920s that many defiant residents of a small town in Iowa became outlaws — producing a high-caliber and much sought-after whiskey known as Templeton Rye." But there's another way Templeton's bad, far less romantic than defiant outlaw bad, more a manipulative, lying, marketing bad. Like many "craft" distillers, Templeton wants us to believe its product is local, made from a special recipe infused with romantic history. In fact, Templeton's distilled in a factory in Indiana owned by Midwest Grain Products, where a whole lot of other "craft" whiskey is produced, including Bulleit rye. Templeton is Iowa-made like Facebook is a community of our friends, something so blatantly fake going on in both cases. The dude who told me about Templeton in Omaha, though — he was not fake, not a poser. He was a true-blue racist, and he knew it. He didn't act proud of it, but he didn't seem to think it was awful, either. It was just a fact. Like the fact that he was American, Lutheran, Baptist, agnostic, Democratic or Republican, independent or indifferent. He told me how his dad's white unit in World War II was supported by an African American unit in Italy, jam-packed with the most lazy black troops you could imagine, nearly getting the white boys killed. He told me how lucky I was to live in the Northwest, because Indians in the Northwest are better than Indians in Nebraska and South Dakota, who are nothing more than drunkards and thieves. He was an older man, the relative of a friend I was with, and he liked to talk. "I'm a bigot," he told me, and I didn't argue, didn't know what to do or say, and so I did nothing. I don't think it was politeness on my part that kept me silent. As demonstrated by my experience with the bullwhip and the excrement-face, I can be rude and pushy. "I'm a bigot," he told me. Not proud. Just a statement he could make to a white dude he didn't know. At least he knows he's a bigot, I thought. But what value did that have? Why would I give him credit for showing that ugly piece of himself? Maybe the racist cop in Des Moines a week earlier knew he was a bigot too, but just so happened to be nice — to me at least. The friendly bigot. We sat next to each other drinking coffee in the food building. He was not in uniform. It was through conversation that I learned he was a cop. I used to work with cops as a teacher's union leader on Long Island. The public sector unions around New York City share common interests, often bargaining health care and administering benefit funds together. I'd learned how to talk to cops, to be comfortable with cops. And even though I'd always been wary of cops, I had the advantage of having worked with them, and the advantage of being white. I was wearing shorts and a button-down shirt, drinking coffee, non-threatening as hell. This cop had not seen my excrement-face behavior in the Western tent. We talked overtime, back pay, force reduction — union talk. The friendly cop told me that every single cop he knew was being or had recently been investigated for harassing or profiling or otherwise acting "unprofessional" with a minority motorist. Since Ferguson, he said, it was nearly impossible to pull over a non-white driver without some kind of charge being filed. He told me when I asked that, yeah, Ottumwa was okay, if you liked tacos. But the way he said this, and the way he talked about Ferguson earlier, somehow didn't seem as awful in the air as it did in my mind later, or now on the page. Because he was so goddamn friendly. Because he was just stating one of the facts of his life. Because his voice was sort of musical. He said that Amish people were the most dependent independent people you could ever meet. They could do very little for themselves, really. Not that he minded! Just something to note! He told me the state fair used to require fewer cops, but then there was the incident a few years back when the East Side homies ran wild on East Side Appreciation Night or Neighborhood Night or whatever it was, the East Side homies harassing families and couples and kids, and now the cops had to have a tactical team at the fair most nights. I kept asking questions, helping him reveal himself, all in the friendliest, calmest, most bigoted way. Then, a week later, the dude in Omaha showed me his bigotry. Was this part of the big friendly? Was it nothing more than clan behavior, tribal recognition and entrenchment, white dudes finding other white dudes and trying to bond based on opposition to/disdain for/hatred of non-white dudes? Maybe. But neither of these men seemed to be looking for my approval. They didn't require that I nod along with them. I was a sounding board, yes. And I didn't walk away. I didn't say "Ottumwa sounds like my kind of place." I didn't say "I love the Amish." I didn't say "Shut up, man." I didn't say anything. In the weeks that followed, I couldn't stop talking about these people, but no matter how many times I told the story, I couldn't get to the end of it, couldn't let myself off the hook. I don't believe there are more bigots in the Midwest than anywhere else. I do know, though, that people were nicer in Iowa than they are in New York, than they are in Washington state. On the way home, Kate and I drove fast along the Canadian border, drinking a Big Friendly before we were done for the day. The next day, we drove through the oil fields of North Dakota, the man camps, boom camps, less populated now that the price of oil was tanking, but the drilling rigs and pumps everywhere and flames from the flare stacks creating a kind of shimmering hellscape. The sky was hazy and smelled like smoke. We'd been gone for weeks and didn't remember that the West was on fire — Oregon, Montana, Washington and Idaho all burning. We thought the smell and haze was from the oil fields, the flare stacks, but the haze and smell got heavier and thicker, more decidedly campfire and then forest fire, burning our eyes as we drove on Route 2 in Montana, the Highline. We smelled and tasted fire for two days, the haze everywhere, as pervasive as the '70s Album Oriented Rock we'd heard all over the Midwest. We stayed in East Glacier for next to nothing because no one wanted to stay near a national park surrounded by fire, and on the next day, our last day, we drove through the Flathead Reservation, through a tiny town called Hot Springs, past their high school, with a sign out front that said, "We Support our Savage Heat." We looked at each other, a long look that said: Is it possible that teams from a reservation high school would be called the Savage Heat? Google told us it was possible, that the name of the teams had been changed in 2007 from the Savages to the Savage Heat. Google also told us that the town of Hot Springs, within the Flathead Reservation, is 77 percent white. When the Savages changed their name to the Savage Heat, the Missoulian reported the Hot Springs school superintendent as saying, "There was a lot of public support for the name Savages, but also a very vocal opposition to it. The board elected to keep the name... but this year the kids took it up, and I couldn't be more proud of them. They wanted something they can be proud of, and using 'savage' as a descriptor and not something that would indicate any people was their idea." Samuel Ligon's second novel, Among the Dead and Dreaming, comes out this spring, as does Wonderland, a book of short stories illustrated by Stephen Knezovich. He teaches at EWU, edits the journal Willow Springs, and is artistic director of the Port Townsend Writers' Conference.